Portable All-Weather And Sun Umbrella Just $35.99! Down From $60! PLUS FREE Shipping! You are here: Home / Great Deals / Amazon Deals / Portable All-Weather And Sun Umbrella Just $35.99! Down From $60! PLUS FREE Shipping! Hurry over to Amazon and score this Portable All-Weather And Sun Umbrella for just $35.99 down from $59.99 PLUS FREE shipping! Sit and enjoy sporting events or nature in your own environment. With an innovative design, the Sport-Brella protects you from the elements but won’t restrict your view. A beach umbrella, sun tent, rain shelter, and more, the Sport-Brella gives you instant, portable protection from the elements regardless of your activity. It sets up in seconds and features a large canopy that shields an entire family or team while lounging on the beach or cheering on the team from the sidelines. Awesome! UPF 50+ PROTECTION. The Sport-Brella will keep your skin safe and protected from over 99.5% of UVA and UVB rays. With side panels for extra protection and wind flaps for ventilation, you’ll get everything you need from this oversized umbrella. LARGE CANOPY W/ WINDOWS. This easy set up shelter protects you and your team, anytime, anywhere.The side zippered windows are for easy airflow and visibility. 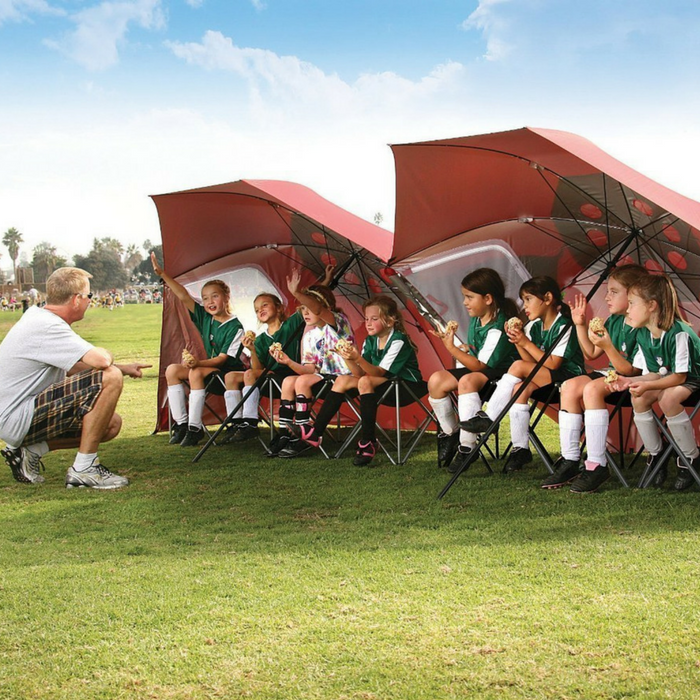 If you’re spending your days at the field, or the beach, stay shaded with the Sport-Brella. WATER REPELLENT AND WEATHER PROTECTION. Protect yourself from rain, wind, or sun with the Sport-Brella. The water repellent structure will keep you dry and relaxed on rainy game days, or cool from the warm summer sun at the beach.